1. Preheat the oven to 200˚C, gas mark 6. Trim the beetroot, leaving 1cm of stem attached. Wash, then wrap individually in squares of foil, adding 1 tbsp water, a small sprig of thyme, a pinch of salt and a splash of olive oil to each before sealing. Put the foil packages on a roasting tray and cook in the oven, until easily pierced with a sharp knife. Check after 40 minutes, and then every 10 minutes. It could take up to 1 hour 30 minutes if they are large beets. 2. Leave to cool a little, then rub off the skins, cut into chunks and place in a mixing bowl. Add the shallots and capers. Mix the vinegar with the sugar, some black pepper, a good pinch of salt and 90ml oil and whisk to combine. Mix with the beetroot, season if necessary then set aside. 3. When ready to serve, stir through three quarters of the mint leaves, add the watercress and gently toss together. Divide between 4 plates. 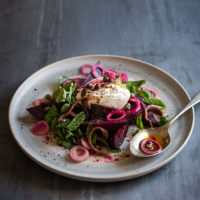 Tear the burrata or goats’ cheese in half; place one half on top of each serving of beetroot. Top with 3-4 anchovy fillets and a few grinds of black pepper, add a splash more olive oil to each plate, then scatter with the remaining mint. Serve immediately.